Choosing the right internship, externship or residency is an important part of your overall learning experience. We want you to get the most out of your time with BluePearl. That’s why we encourage you to explore all of our opportunities, visit us in person if possible, and pick the position and place that feels right to you. This rotating internship program is available to veterinary school graduates with or without a previous background in private practice. Our goal is to give you a diverse, high quality clinical experience within a vibrant and supportive hospital culture. You’ll participate in daily clinical rounds, present formal rounds, manage specialty surgical and medical cases, receive and manage emergency cases, and work closely with board-certified specialists. Prerequisite : Graduation from an AVMA-accredited veterinary college. Our specialty internships are designed for veterinarians who have completed a rotating internship and intend to seek further training in a residency. The specialty internship is a focused program that may include research and manuscript preparation, in addition to lectures, clinical case evaluations, advanced diagnostic and therapeutic procedures, formal rounds and more. Prerequisite : Rotating small animal internship program with BluePearl or other veterinary practice. 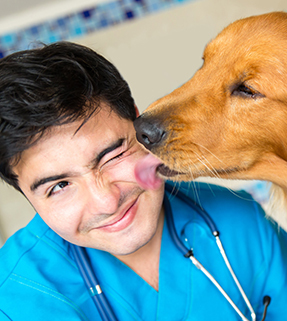 Externships are open to veterinary students from AVMA-accredited schools. BluePearl externships include rotations through hospital services and allow you to observe our specialists, senior emergency clinicians, residents and interns in action. You can also participate in lectures, journal clubs and rounds where applicable. Specialties available for externships vary by location. In an effort to provide hands-on experience, we require all student externs to have current AVMA PLIT liability insurance and medical insurance to cover any injuries that may occur on site. AVMA PLIT liability insurance is free for student members of the AVMA. You may apply for this coverage on their website (http://www.avmaplit.com/) and they will produce a certificate of coverage. You must renew AVMA PLIT liability insurance on an annual basis. Please check to make sure your coverage is current before arrival. For inquiries regarding externships, please email veterinary.students@bluepearlvet.com. Not only will you receive the training to become an exceptional specialty clinician, you will experience an unexpected level of collaboration, support and access to a unique community of talented clinicians. New residency programs are also added each year consistent with our vision to transform veterinary medicine through continued innovation. The BluePearl EmERge Program is designed to give veterinary school graduates the necessary training to become successful emergency clinicians. It’s a full-time job from the start, and will prepare you for your first solo ER shift at one of the more than 50 BluePearl hospitals throughout the country. Designed by Rita Hanel, DVM, DACVIM (SAIM), DACVECC, BluePearl’s Vice President of Clinical Operations and Recruiting, the program combines lectures, interactive seminars, labs, cadaver surgery, mentoring and hands-on practical experience. Not only will you receive valuable training from experienced veterinarians, you’ll be paid a salary from the first day of your course. This program is an immersion in emergency medicine and does not replace or substitute an internship, which is required for application to a residency. If you are a graduate of an accredited veterinary school and are interested in becoming an emergency clinician, or a practitioner looking for a career change, the EmERge Program will give you the training and experience you need to launch your career in the fast-paced and exciting field of emergency medicine. Course availability subject to minimum number of attendees. The total commitment is three years. 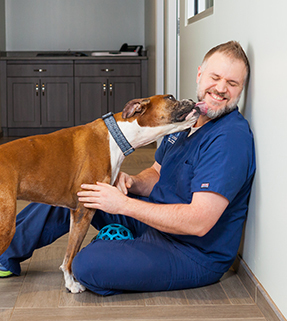 The EmERge Program gives veterinarians the opportunity to join the BluePearl team, which is known for its emphasis on clinician-driven, collaborative medicine. Graduates of the program will have the training necessary to think on their feet and handle the challenging cases associated with emergency veterinary medicine. It’s a fast-moving and satisfying environment, with the opportunity to see interesting cases and perform complex procedures. And you’ll be guided by experienced BluePearl clinicians who are invested in helping you succeed and build your career. After completing a residency in small animal internal medicine at the University of Florida with a successive residency in emergency and critical care at BluePearl in Tampa, Dr. Hanel joined the faculty at North Carolina State University College of Veterinary Medicine for 10 years beginning in 2006 and was Director of Emergency Services for six of those years. She has published more than 20 manuscripts, book chapters and, recently, best practice guidelines for prehospital care of dogs and cats. She taught students and trained more than 100 house officers with her colleagues. Along with a team of experienced and skilled emergency and critical care clinicians, this course was developed to ensure the success of anyone desiring a career in emergency medicine and will start you on the path to success as a BluePearl associate. For more information, contact clinicians@bluepearlvet.com.